Doug LaMalfa (R-Richvale) spoke on the House floor on 72 of the 157 legislative days in 2015. LaMalfa is a farmer who serves on the Agricultural and Natural Resources committees and often speaks about rural or agricultural issues. His family has been growing rice in the Northern California town since the early 1930s. LaMalfa spoke more often this year than all U.S. representatives other than Rep. Glenn Thompson (R-PA) and Rep. Sheila Jackson Lee (D-TX). Thompson addressed the House on 110 days in 2015, and Lee spoke before her congressional colleagues on 87 days. Rep. Kevin McCarthy, who formerly represented parts of San Luis Obispo County, spoke on the House floor the second most often among California representatives. McCarthy spoke on 44 legislative days in 2015. This year, McCarthy launched a bid to become Speaker of the House, but he withdrew from the race when it appeared he did not have enough support. McCarthy remains the House Majority leader. Former House Speaker and current House Minority Leader Nancy Pelosi spoke the fifth most often among California representatives this year. Pelosi spoke on the House floor 38 times in 2015. Capps finished just behind Pelosi, placing sixth among California representatives. Capps addressed the House 32 times this year. In a recent stretch, Capps spoke on the House floor four times over the first nine days of December, CSPAN archives show. In those appearances, Capps spoke about climate change, gun control, recalled vehicle rentals and climate change. Is Adam Hill crying wolf? Note to congress and POTUS: Shut up and get out of the way. It is congress and the POTUS that is killing the middle class. The middle class pays the taxes and congress and the POTUS uses these funds to give away “free” stuff. There is no free lunch, by taking from the makers and giving to the takers, it just makes everyone poorer without giving the takers any incentive to work their way into the middle class. Our government is failing us, we need to be smarter in the next election and hire, through our votes, representatives that get it. How about tracking what they say and if any of it is of substance or reflects the slightest intelligence. Has she ever had an original thought? Well, considering Sheila Jackson Lee was in the top two, I’d say it’s safe to say that a good chunk of congressional speaking had any substance, coherence, or intelligence. It’s a safe bet. I almost feel sorry for those who have to listen to these people. In all seriousness, I have e mailed her like once a month on a few different issues. All I get back are auto “thank you for writing” replies. Every day citizens need our own lobbyists. I, too, have emailed Lois numerous times on various issues, the canned reply “thanks for your input” gives me the impression that she doesn’t care, is ignorant of the issue, or plans to vote however Polosi tells her to? ACTION speaks much louder than words. So, What are you saying ? Not being snarky here ( well …maybe a little ) …Do YOU have actions, or just rambling comment board ‘words’ ? How about supporting the one national legislator that has had the most laws and amendments passed over the past 4 years ? An EFFECTIVE representative that gets work done. Now running for the US Senate. Why do people in California care about Florida? We are not talking about ME, the thread is talking about California congressional elected representatives. I simply stated a fact. Spin it any way you choose. Poor slowerfaster, it seems you just don’t get any love from anyone anymore. We have their actions, a state with trillion dollar unfunded pension systems, thank you Democrats. 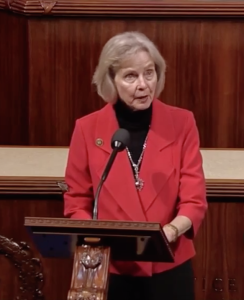 But does anyone remember ANYTHING Lois Capps has said in almost 20 years in Congress? Time for Lois to retire. Katcho will be a Congressman in tune with Central Coast voters. Isn’t talking good over being silent? And she no doubt said the least.